A rainwater harvesting system is only as good a the quality or the rainwater that is recovered and stored in the system. To design a successful system our engineers focus on water recovery and the quality of water within the system prior to treatment . Effective pressurized water treatment to the required standard. Much research and experience lead us to the Wisy® range of primary rainwater filters. These filters screen all particulates larger than 0.28mm in the smaller filters and 0.38mm in the larger filters from the water before it enters the tanks. This greatly limits the amount of organic material and contamination that can be found in a rainwater tank. The operation of the filter also removes the need for a first flush diverter. When the filter is dry the first amount of water flows freely over the filter mesh. Only when the screen is wet, and water starts flowing through the filter does it really start becoming effective. This characteristic provides a first flush mechanism.The self cleaning operation of the filters also means that decaying bio-matter is not left in the path of water flowing into the tanks, only for the contaminants to be transported into the tanks in the next rainfall, as is the case with inline screens. There are two mechanisms which drive the water through the filter screen. Water adhering to the perforated layer behind the filter screen and the negative pressure created by the filtered water flowing through the sealed transport piping. The operation is very effective and results in an average annual efficiency of 95%. The 5% of water lost is what is used to flush the filtered debris away. This efficiency has been independently verified by in house testing. Between rainfalls the roof collects contaminants like leaves, animal droppings, dust etc. The first part of rain that comes off the roof carries the highest concentration of these contaminants. A first flush diverter discards this first lot of water. 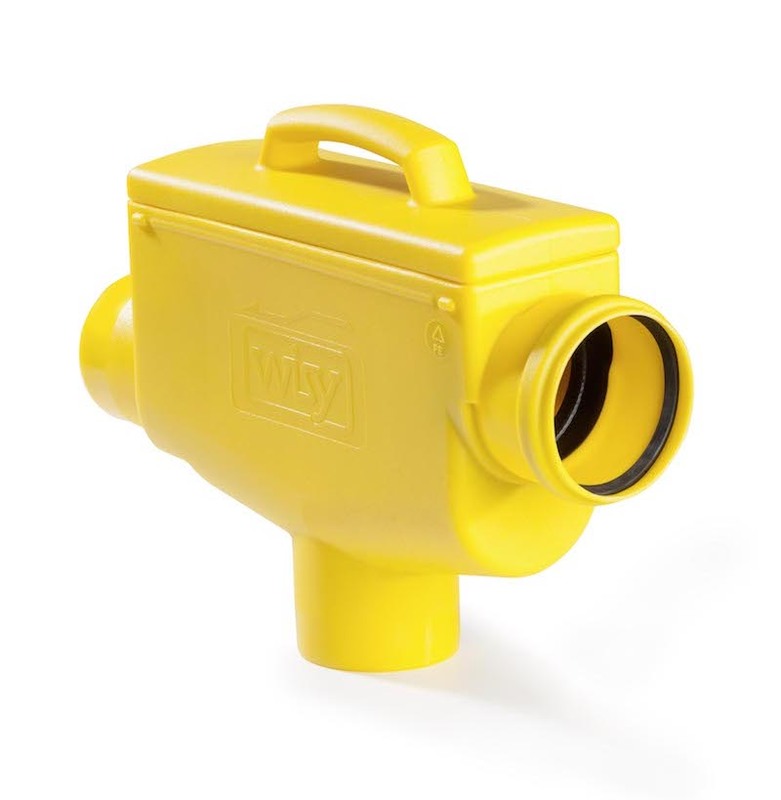 As discussed in the primary rainwater filter explanation, the Wisy® achieves a degree of first flush diversion through their operation. Fine sediment carried in by the inflowing rainwater settles on the floor of the tank. This layer harbors microbes that provide a natural treatment to the water inside the tank, thus the layer is referred to as the bio-layer. A calming inlet slows the incoming water and diverts it up away from the bio-layer, thus preventing the inflowing water from disturbing the bio-layer. The calming inlet is placed at the bottom of the tank. This improves the quality of water in two ways: the first by providing oxygen rich water to the bio-layer which encourages aerobic microbial action, and the second by reducing the distance any fine particulates need to travel to settle out of the water. In biological water treatment, two types of reactions occur: aerobic and anaerobic. Aerobic reaction consumes gaseous oxygen, is much more effective and the by-products of these reactions are mostly H2O (water) and CO2 (Carbon dioxide). Anaerobic reaction is less effective and produces primarily CH4 (Methane) and H2S (Hydrogen sulphide, rotten egg smell) as by-products. This is what gives old grey water and stagnant water it's smell. The floating suction sits just below the surface of the water. This top layer of water is the oldest and cleanest water in the tanks. It has the lowest concentration of entrained particulates, and has had the longest 'treatment' time with the healthy natural microbes. The floating suction also prevents suction vortices from disturbing the bio-layer and therefore also prevents settled sediment from being drawn into the supply system. The floating suction also ensures proper water circulation, as the tanks are essentially filled from the bottom, and being emptied from the top. Some of the debris and contaminants float to the surface and form a layer of floating debris. Debris such as pollen and oil based matter form a floating layer on the water surface. This builds up over time and eventually insulates the water from the air. This prevents the transfer of oxygen into the water, reducing the amount of aerobic microbial action that takes place. The overflows are designed so that the floating debris will get discharged out the tank when the tanks overflow. The overflows generally have a P-trap and an insect screen to prevent the possibility of any vermin from entering the tank. 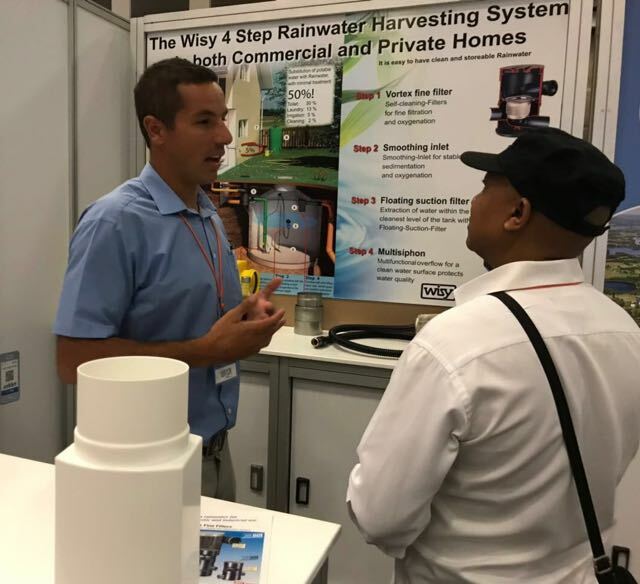 It is for this reason rainwater tanks should be sized to overflow at least twice a year.By ensuring the above steps are implemented in a rainwater harvesting system, the quality of water will be vastly improved, even before any post filtration. Various methods are used for removing the fine particulates from the water. We generally filter all particulates larger than 1 micron from the water. In some domestic installations a back-washable sand filter which removes particulates larger than 80 micron is the first step, then a 20 micron pleated cartridge filter followed by a 1 micron pleated cartridge filter. The activated carbon and KDF unit treats the water for any residual colour and odor that might be present in the water. It also removes chlorides and heavy metals from the water. 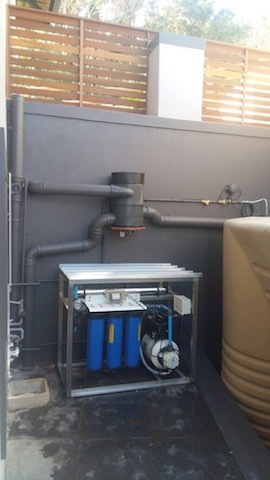 The UV steriliser kills 99.9% of all microbes that might still be present in the water.The above steps are scalable and can be applied to large industrial scale installations as well as small domestic systems.Water tested from systems that we have installed with the above steps, consistently produce water of better quality than that of the municipal supply.